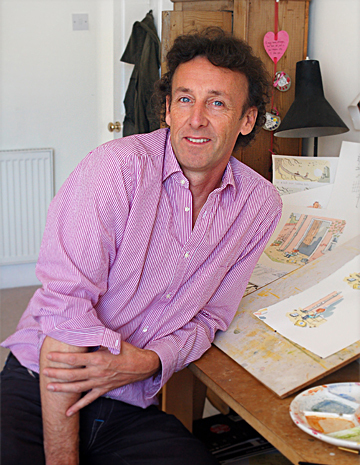 Simon James grew up in Bristol and Exeter, and was educated at Queen Elizabeth School, Crediton. 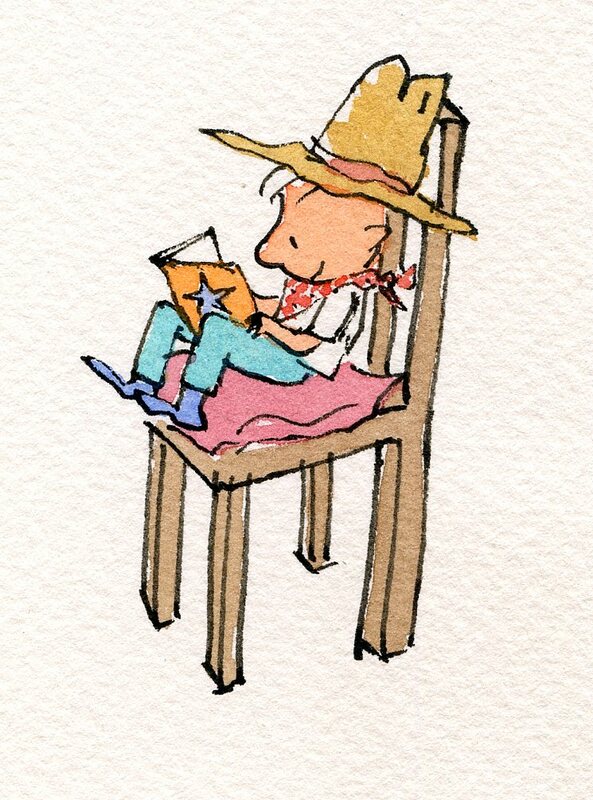 From an early age he spent much of his time drawing and stapling stories into little books. His father had lots of books on cartoonists, many of whom Simon tried to copy – his favourites were Ronald Searle and Gerard Hoffnung. He spent the rest of his time climbing trees, saving worms from puddles and worrying about the strange shapes in the curtains at night. After leaving school Simon had many different jobs whilst hoping to become a cartoonist. Some time later he went to college to study graphic design and art history. “Whilst working with words and images together I developed a greater understanding of the techniques used in creating picture books,” he says. After college, Simon went back to spending much of his time drawing and stapling stories into little books – and still does to this day. Simon’s first book, The Day Jake Vacuumed, was published in 1989 – and two more books about Jake soon followed. His first title for Walker Books, My Friend Whale, was the first of several concerned with a child’s relationship with the natural world – Dear Greenpeace, Sally and the Limpet, The Wild Woods and The Birdwatchers have established Simon as one of the country’s leading author/illustrators. Leon and Bob won the Smarties Book Prize Silver Award and was the New York Times Best Illustrated Book of the Year, and Days Like This, a collection of small poems, was shortlisted for the Kate Greenaway Medal. Baby Brains has won numerous awards including the Picture Book prize and the Overall Winner at the Red house Children’s Book Award. His books have been published in over twenty languages around the world. Now, with over twenty titles, including the recent, George Flies South, Nurse Clementine and REX, Simon has established himself as a hugely popular picture book author for young readers today. Simon continues to be a much sought-after speaker in schools, festivals and conferences both in the UK and in the USA. 10 things you didn’t know about Simon James. His favourite sound is birdsong, especially the songs of blackbirds, skylarks and chaffinches.